Sweet and Savory Honey Fig Goat Cheese Cake – tender honey cake layers with a goat cheese filling, fig jam and mascarpone frosting. 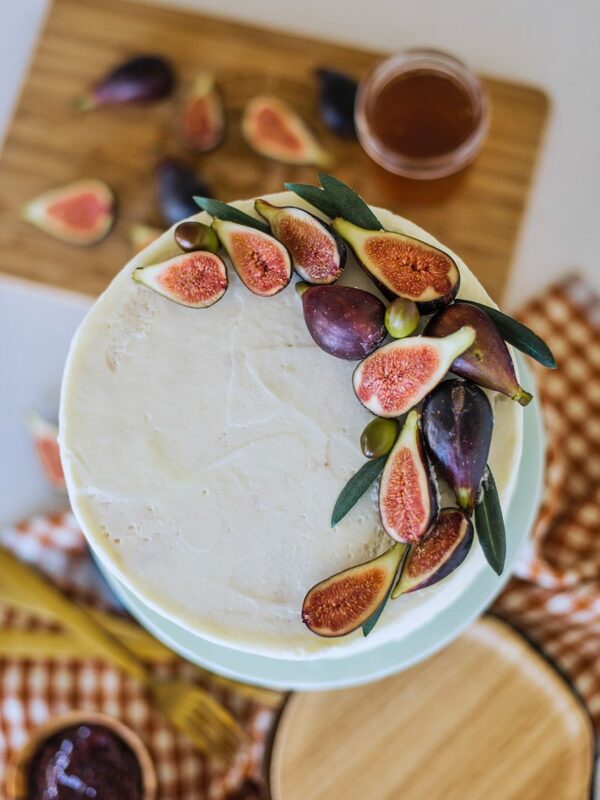 The idea for this Sweet and Savory Honey Fig Goat Cheese Cake stems from my mom’s homemade fig jam. She has a hill of fruit trees in her backyard, one of which is a fig tree, so she’s often making some kind of curd or jam with the abundance of fresh produce. The other day she called to tell me she was whipping up a couple batches of fig jam. With a visit from her just around the corner, I quickly asked if she’d bring me a jar and then started thinking up flavor combinations for my next cake. I immediately knew I wanted to do a goat cheese filling with the fig jam. I mean, who doesn’t love a good charcuterie board? Cheese and fruit are meant for each other! Of course, the goat cheese needs to be sweetened up a bit, so I added some honey and then lightened the texture by folding in whipped cream. The goat cheese is a strong flavor so you won’t need a lot of the filling between each layer. It just adds a nice savory element to the cake, without being too heavy or overwhelming. 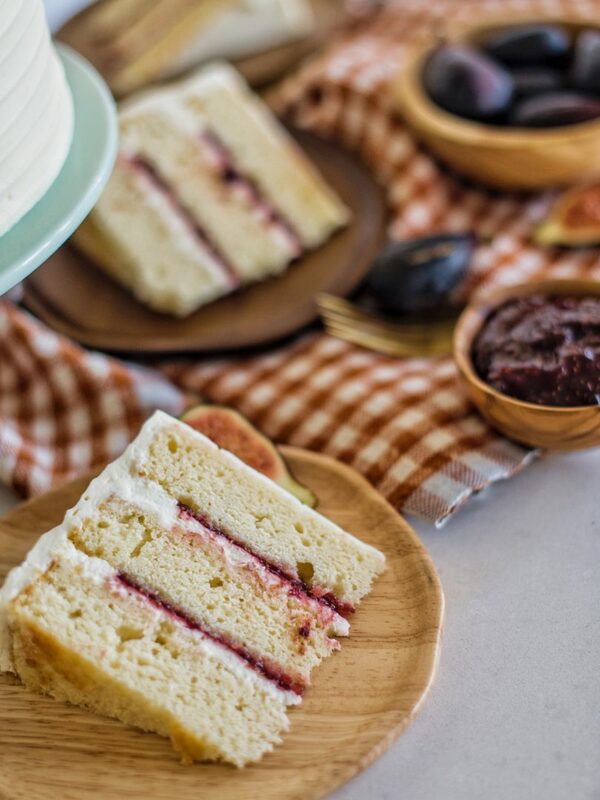 The fig jam is simple and slightly sweet. Providing a nice balance to the savory goat cheese. I don’t ever fill my cakes with too much of a soft filling. Instead, I use about 1/2 cup between each layer and then reserve the rest to serve on the side of each slice of cake. To complement the filling, but not take away from it, I used a light mascarpone frosting. I used the same recipe from my Lemon Gingerbread Cake from last Christmas (one of my favorites! ), and I’m so happy with the combination. The hint of lemon is the perfect addition to the flavors in this cake. 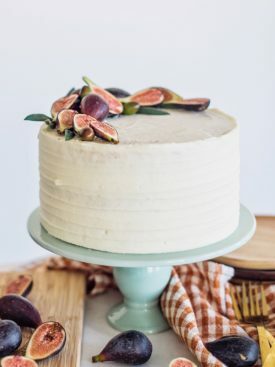 As for the cake, I thought about doing some sort of spice cake but felt like that might fight with the flavors of the fig jam too much. Instead, I went with a honey cake and used the base of my Honey Pear Upside Down Cake. It’s tender, sweet, slightly dense and just so perfect for this cake. I’ve been so eager to share this recipe with you and cannot wait for you to try it! Enjoy! 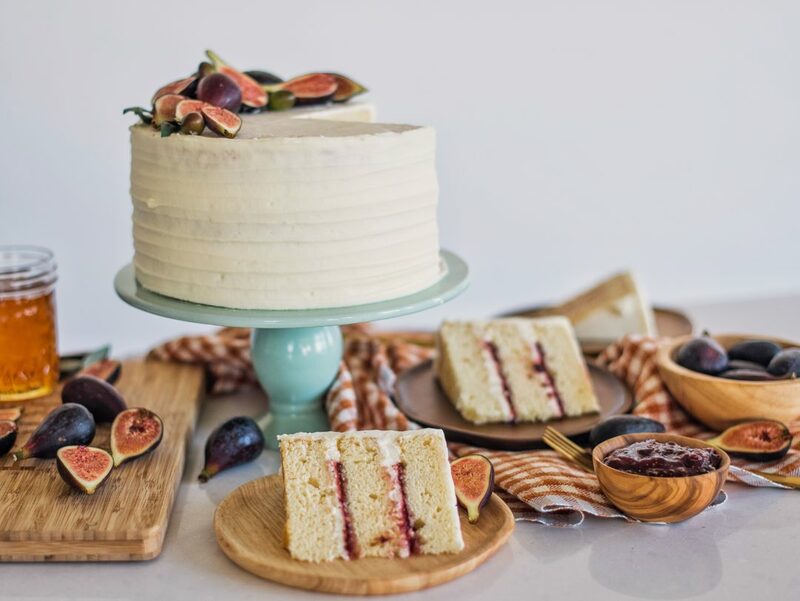 Tender honey cake layers with goat cheese filling, fig jam and whipped mascarpone frosting. Preheat oven to 350 degrees F. Spray three 8-inch pans with nonstick spray, line the bottoms with parchment paper and spray again. Set aside. In a small bowl, mix together the buttermilk, honey and vanilla. Set aside. In the bowl of a stand mixer fitted with the paddle attachment, beat the butter and sugar on medium speed until fluffy, about 4 minutes. Add eggs, one at a time, beating well after each addition and scraping down the sides of the bowl as needed. Gradually add in the dry and wet ingredients, alternating between the two, starting and ending with the dry ingredients. Mix until just combined. Evenly divide the batter between the three cake pans (about 16 to 17 ounces in each). Let cool in pans for 5-10 minutes, then remove to wire rack to finish cooling. In the bowl of stand mixer with the whisk attachment, whip the cream until stiff peaks form. Set aside. In a medium bowl, combine the goat cheese and honey and mix well. Fold in the whipped cream. Store in the fridge until ready to use. In a medium size saucepan, combine all the ingredients and bring to boil. Continue to simmer the mixture on low for 30 to 60 minutes until thick. In a food processor or blender, process the jam until it's nearly smooth. Pour into mason jars and refrigerate until ready to use. Best to make a day or two ahead of time. In the bowl of an electric mixer, whip the heavy whipping cream until stiff peaks form. Transfer to another bowl and set aside. In the same bowl for the electric mixer, combine the mascarpone, powdered sugar and lemon extract. Mix on medium speed until incorporated. Gradually fold in the whipped cream to the mascarpone mixture. 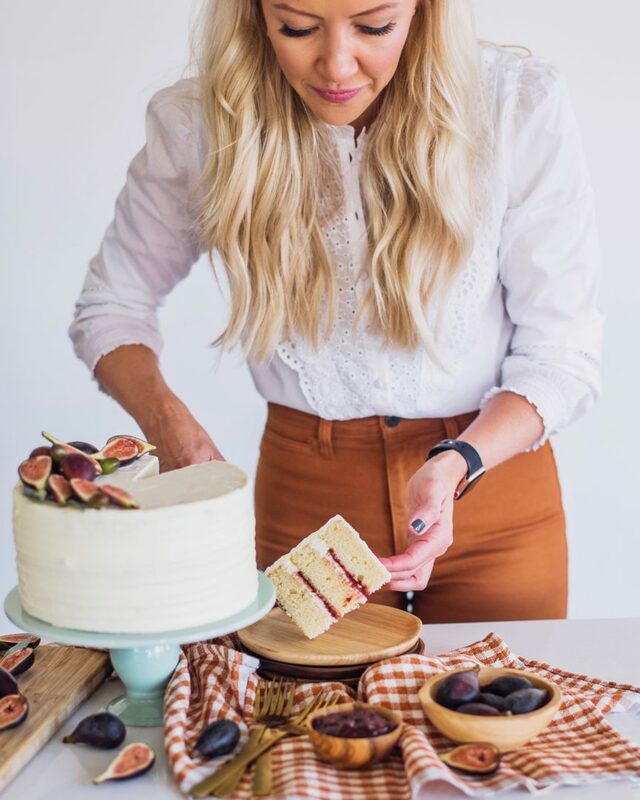 On a cake board, spread a small dollop of frosting to hold the cake in place. Place your first cake layer on the board. Spread about 1/2 cup of the goat cheese filling on the cake layer. 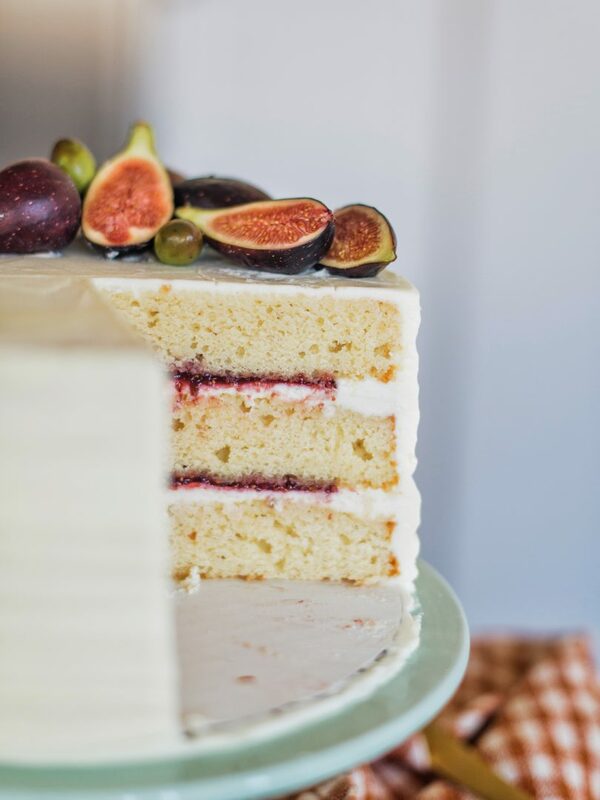 Pipe a rim of mascarpone frosting around the edge of the cake and then fill the center with 1/2 cup fig jam. Place the second cake layer on top and repeat step 2. Place the final cake layer, top side down, on the filling. Freeze the cake, with no crumb coat, for about 20 minutes. The mascarpone frosting won't freeze like normal buttercream, so I don't typically do a crumb coat and will just frost the cake roughly just one time. Chill in the fridge, covered, until ready to serve. This looks beautiful! I just made some fig jam two weeks ago – what a perfect use for it! (Although, I’d love to try your mom’s recipe too, it looks a bit different than mine).